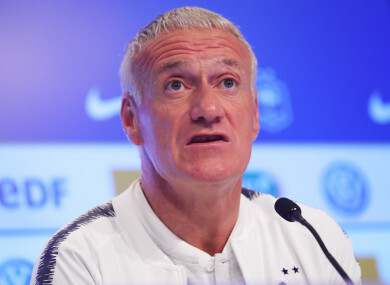 DIDIER DESCHAMPS HAS warned his World Cup-winning France side against complacency, stating that success is often followed up with ‘bullsh*t mistakes’. Deschamps led Les Bleus to their second title in Russia’s 2018 showpiece and, although they finished the tournament undefeated, the team were criticised in the early stages of the competition. A 2-1 result against Australia was followed by a narrow 1-0 win over Peru, with a 0-0 draw with Denmark making up the full set of results from the group stage. And, while people now look at France as being the best in the world, Deschamps was keen to point out that he has not forgotten about the struggles he and his team faced on their way to glory. “For a player or coach, there is nothing better than the World Cup,” the 50-year-old said in an interview with L’Equipe. “You make history when you win, but things could have been very different with a few minor differences in results. After the win, everything looks okay, we reached our peak, but we must not forget the first days of training and the problems we encountered during the competition. France almost tasted glory under the former midfielder at Euro 2016 but ultimately fell to Portugal at the last hurdle. And Deschamps believes that defeat served as good experience heading into the World Cup final against Croatia. “Losing in the Euro 2016 final serves us well in terms of preparation,” he said. “I’m not going to say it’s because of that that we won the World Cup final, but it served the players well, and even me, in relation to preparation, even if it was not the same context. France return to action with their first Euro 2020 qualifier on Friday as they travel to Stadionul Zimbru to face Moldova, followed by a clash with Turkey three days later. Email “'It's after success that we make the biggest bulls**t mistakes' - Didier Deschamps”. Feedback on “'It's after success that we make the biggest bulls**t mistakes' - Didier Deschamps”.